Once the big day has passed and everyone has their fill of Thanksgiving turkey, gravy, pumpkin pie a la mode, ham, yams, stuffing, cranberry sauce, and football, we're all left with a food colma, stuffed belly, tryptophan, and a surplus of leftover food. This is a common occurrence for many families around the country the day after Thanksgiving, and one may ask what are we to do with all these leftovers? Most of the time I just reheat whatever was left over and have myself a meal with that. There is one thing, however, that I do that is beyond just reheating it in the microwave the next day and it's nothing complicated - quite simple actually. In my family we usually have a turkey weighing in at twenty pounds and a HoneyBaked ham at six pounds as our primary proteins for Thanksgiving, so having Thanksgiving day leftovers is a given for us whether you deep fried a turkey or popped it in the oven. 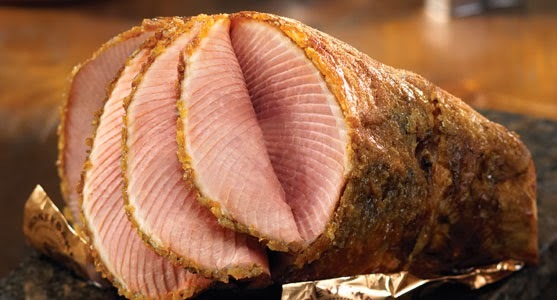 On the day of Thanksgiving, I of course have my share of turkey, but I actually don't touch the ham at all. Pan frying leftover Thanksgiving ham (left) and turkey (right). I just don't like the taste of the ham as is, but once Thanksgiving is over, the tryptophan has worn off, and Black Friday rolls around, it's a totally different story. What I like to do the day after Thanksgiving is to put the leftover turkey and especially the leftover ham into a pan or skillet and fry it up. I'm not talking about deep frying it, but just a simple pan fry. The ham itself doesn't need any extra oil since there's enough oil already in it. The turkey, on the other hand, may benefit from a little bit of oil or cooking spray like Pam. Frying up the leftover turkey and ham doesn't take a whole lot of time either. Pan frying the turkey and ham gives it a nice crispy texture and frying up the ham in particular even gives it an added flavor. 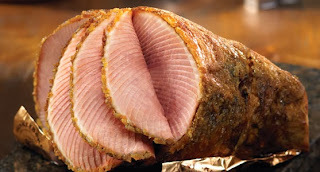 The ham is originally given a honey glaze so when you fry it, the sugars from the honey carmelize and you get the distinct flavor and crispiness on the edges of the ham that you wouldn't get on the turkey. If you plan on frying both the turkey and ham in the same pan, definitely do the leftover turkey first and then the ham. The sugars on the ham will stick to the pan and once on the pan it'll burn. That's fine when frying the ham, but once the ham is done, you still have the turkey to fry up. That is why I highly recommend doing the turkey first and ham last, so the sugars don't get too burned and smokey on the pan when frying the turkey last. With the fried up slices of turkey and ham, I sometimes have it with some rice and scrambled eggs if I'm in the mood for a breakfast type meal or in between two slices of toasted bread for a sandwich. The leftover gravy as a spread in the turkey sandwich really makes the sandwich moist and prevents it from being too dry. You just need to put a little big of gravy because using too much will make your bread soggy and break apart when handling it. For the ham, I would put some cheese in it for a typical ham and cheese sandwich. I like using Swiss cheese in my sandwich. One other thing that I do with the leftover turkey (but not the ham) is to use it in turkey pot pie instead of a chicken pot pie. This works well for both the white and dark meat. I typically use the recipe from America's Test Kitchen for chicken pot pie to make my turkey pot pie. Another idea is to make empanadas with leftover turkey, stuffing, and gravy filling or perhaps making turkey and dumplings instead of chicken and dumplings. Carmelized slices of leftover ham the day after Thanksgiving.